"Á vegum sjónvarpsstöðvarinnar Omega er staddur hér á landi dr. David Tel-Tsur (3.f.v. ), sem er rabbíni gyðingasafnaðar í Ma´aleh Adumim, landnemabyggð gyðinga austur af Jeúsalem. Á blaðamannrafundi á Grand Hótel Reykjavík í gær, þar sem ásamt Tel-Tsur (í miðju) voru mættir sr. Guðmundur Örn Ragnarsson (t.h. ), Eiríkur Sigurbjörnsson, sjónvarpsstjóri Omega (t.v. ), og Ólafur Jóhannsson, formaður félagsins Zíon - vinir Ísrael, skýrði gesturinn frá sinni sýn á ástandið í Ísrael nú á dögum. Sagðist Tel-Tsur vilja koma þeim boðskap til Íslendinga, að trúað fólk hérlendis ætti að hafa í huga að Jesús Kristur hefði verið gyðingur, af "Guðs útvöldu þjóð". Kanaansland, Ísrael, væri land hinnar "Guðs útvöldu þjóðar" og Jerúsalem miðpunktur heimsins. " "Jerusalem is the center of the Earth." Here is now a vistitor in this country, at the Omega Television, dr. David Tel-Tsur, which is a rabbi in a jewish congregation in the town of Ma' aleh Adumim. The town is a jewish settlement east of Jerusalem. 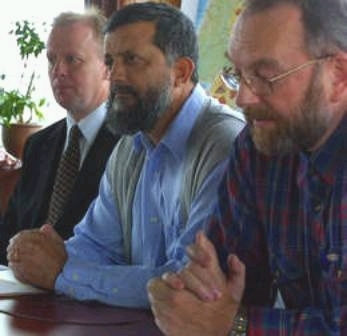 On a press conference on Grand Hotel Reykjavik, yesterday, where with Tel-Tsur (middle), there were pastor Gudmundur Örn Ragnarsson (to the right), Eirikur Sigurbjornsson, the manager of Omega Television (to the left) and Olafur Johannsson, the chairman of the Zion - friends of Israel movement. The guest, explained his view of the situation in Israel today. Tel-Tsur said that he wished to tell icelanders, that Christian believers in Iceland should bear in mind, that Jesus Christ was a Jew, from "Gods chosen nation." The land of Kanaan, is the land of "Gods chosen nation" and Jerusalem is the center of the Earth.